Beautiful pictures of beautiful animals, it is such a shame that we humans are destroying their habitat and killing them all! Amphibians are critically important as indicators of ecosystem health. And they're in BIG TROUBLE around the world! Eberday should be Save The Frog Day as not only are they beautiful and varied, they are out "canaries in the mines" when it comes to our ecosystems and water woes, as well as usually the first to suffer from it tthus goving their lives in warning us! 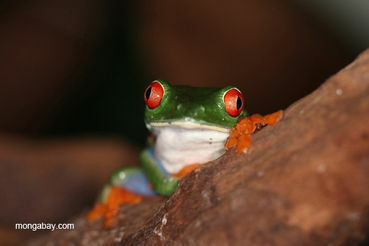 I love that red-eyed tree frog. Such wonderful creatures! And to think I used to love to eat frog's legs!! Better than chicken! Sorry for the typo - caught it as I hit submit - "may', not "nay"
Lovely pictures , so many frogs !!! Frogs are part of this world, they deserve our respect and care!